Transitional in style this chest provides an organized storage space to your small blankets, clothes and documents. 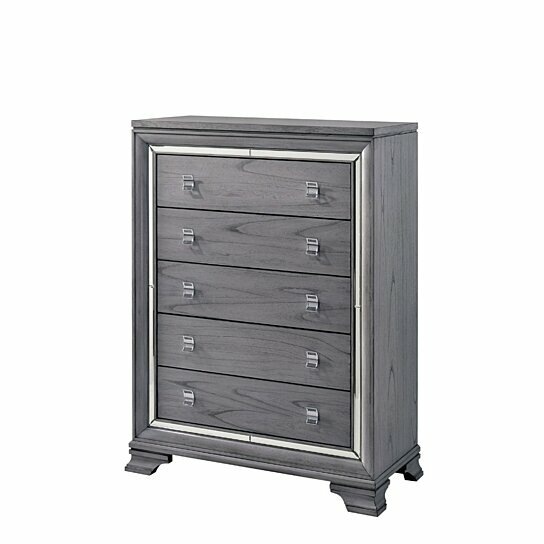 It is made up of solid wood and features five spacious drawers in English dovetail construction. Each drawer features two metal handles that provide easy opening, bordered by mirror trim outline that accentuates its beauty. Supported by bracket feet, this chest has top felt lined drawer that can be used for the placement of jewelries and other delicate items. Constructed from solid wood and metal, featuring mirror trim details. It features five spacious drawers along with felt-lined top drawer.